Once upon a time, there sat two lovely lamb shanks in a supermarket rack. They awaited their destiny, silently wishing for a hint of rosemary or a whiff of pepper to touch them. 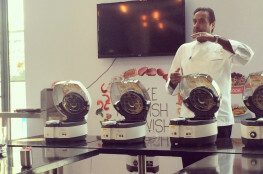 They prayed to be giving life to tagines, or to be perfectly braised to make a chef weep with joy. Soon enough, they felt two sets of eyes on them. They held their breath, as a couple (genetically programmed to be induced by good meat) pushed their pram towards the display rack and nodded at each other. Gently but purposefully, they reached for the two shanks. The rest was history. And of course, shameless gluttony. Later that evening in the FoodKisser’s kitchen, we gave each other high fives, set little Mehreen on her rocking chair facing the kitchen counter, and started with the chopping and peeling. The red wine was uncorked, the veggies were taken out and the oven was lighted. It was showtime. 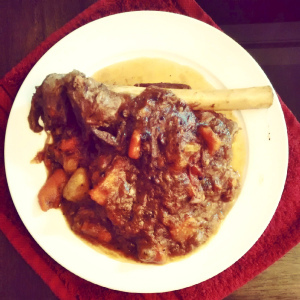 Ladies and Gentlemen, presenting….Braised lamb shanks in red wine and orange sauce!! Lamb shanks were washed and patted dry. Salt and freshly ground pepper were applied onto it. Measurements are as you prefer them. For us, pepper could never be too much. So! 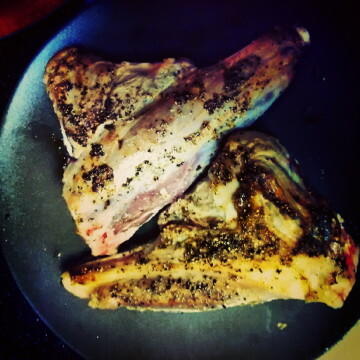 Lamb shanks were browned in a pan in little olive oil. When we were done, we got this. 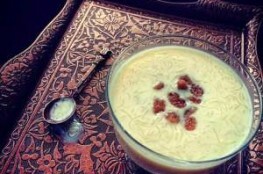 In a large pot (which can be kept inside oven, as well as on stove), pour in the red wine and heat it. 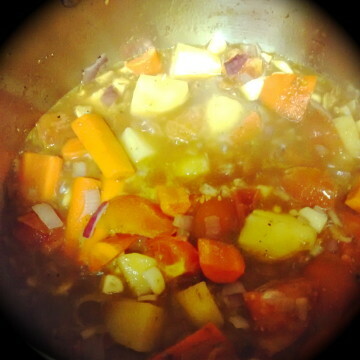 Add your onion, tomatoes, potato, carrots, ginger and garlic into the pot. Let it boil. When the red wine and the veggies met. Add the rosemary powder (or fresh rosemary) into this. Put in the lamb shanks and cover it with the beef stock. Boil. Into an oven preheated at 160 degrees, place the pot. Let it cook for 3 hours. Open the oven every hour to ladle the sauces over the shanks. 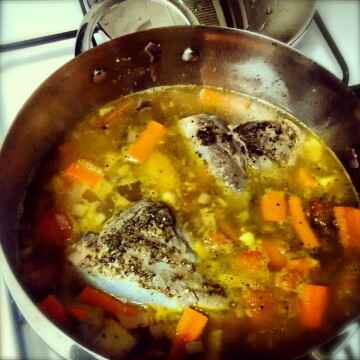 After 3 hours, take the pot and place it back on the stove. Remove the shanks and place it on a separate plate. Squeeze the juice of half an orange on top of the shanks. Let the contents in the pot rapidly boil on high heat. Once the quantity has halved, squeeze the remaining orange into this. Whisk in 2 tbsp of cold butter to give the thickened juice a glazed syrupy feel. Pour the syrup (that is now bursting with fabulous flavors) over the lamb shanks in a plate. Spoon in a mouthful of this awesomeness and bask in the glory of your cooking proficiency! Deliciousness on a plate. With greens to strike that balance. We sautéed some nice broccoli and beans in butter to create a decent green salad as side. Had there been potatoes in stock, you know the salad would have got kicked out of the menu to give way to the almighty mashed potatoes! But alas.With the last morsel scraped onto the fork by the sheer power of greed and not hunger, we were sated to say the least. And in that overly stuffed, exhausted and lethargic state of being, I got this most bizarre feeling that the shanks were thanking us for laying them at their destiny ever so beautifully. 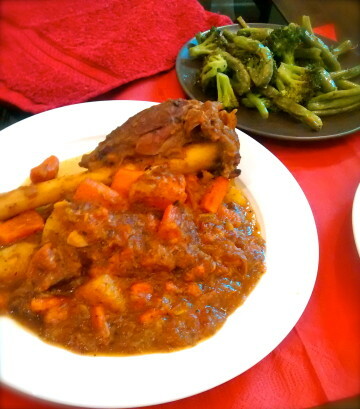 Braised lamb shanks in redwine & orange sauce. Something to fall in love with.